It is a luxurious pied-à-terre in the exclusive modernist real estate development called Casa Burés. The situation of Casa Burés and is ideal to fully enjoy the in the Eixample district of Barcelona, just by going out on the street you can find good restaurants, designer cafes, creative art galleries, exquisite decoration shops and original boutiques. 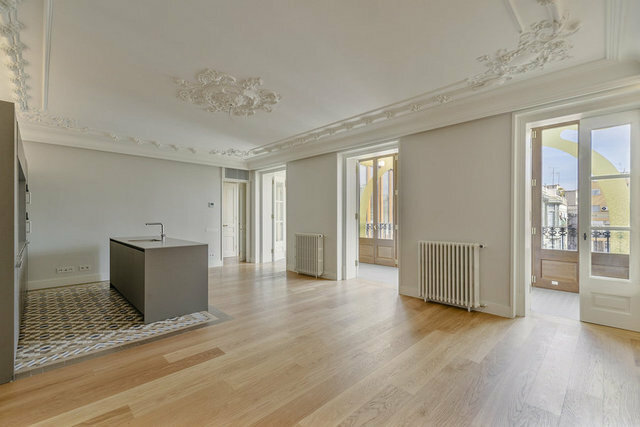 The floor plan of the apartment is made up of 40m2 of day area that is open and integrates the historical elements with the comfort of contemporary life. To this large space is added an L-shaped glazed gallery and oriented the picturesque patio. To complete the proposal, a bathroom and a double suite room. The communal swimming pool with solarium area is located on the terrace, while the basement, an old textile warehouse, has been transformed into a unique space to enjoy the most varied hobbies: indoor 24-meter pool, gym, wine cellar, kitchen and living room with a large table to invite friends, work areas and relax.